Hauskaa lauantaita, tervetuloa viikon Allsorts haasteen pariin! Palloja ja (tai) raitoja pitää näkyä tämän viikon töissä! Hi; Happy Saturday, it's time for a new Allsorts Challenge! "Spots and/or stripes" must be seen this week! 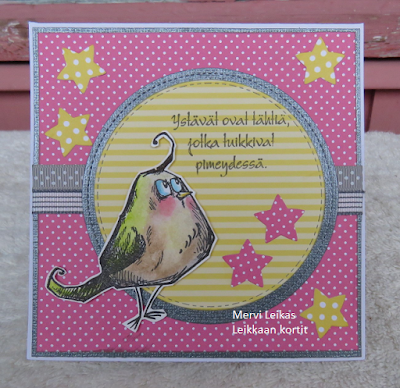 stamp: Tim Holtz, stamped sentiment in Finnish: "Friends are like stars twinkling at the sky...."
It's a real fun bright and happy card with e bright colours and crazy bird Mervi. What a fun card, the colors fit the bird so well and great sketch too! What an adorable bird! I love how you colored him, too. Very cute card!! Thank you for playing along with Crafters Cafe and hope to see you back in the gallery again soon. Love your take on the theme and a super image and design. Sweet and cheerful with my favorite patterns, spots and stripes. You colored the bird so well, I love my crazy birds but don't find them particularly easy to color, but coloring isn't my strong side at all. Wonderful card Mervi! I love that crazy bird and you have coloured it beautifully. 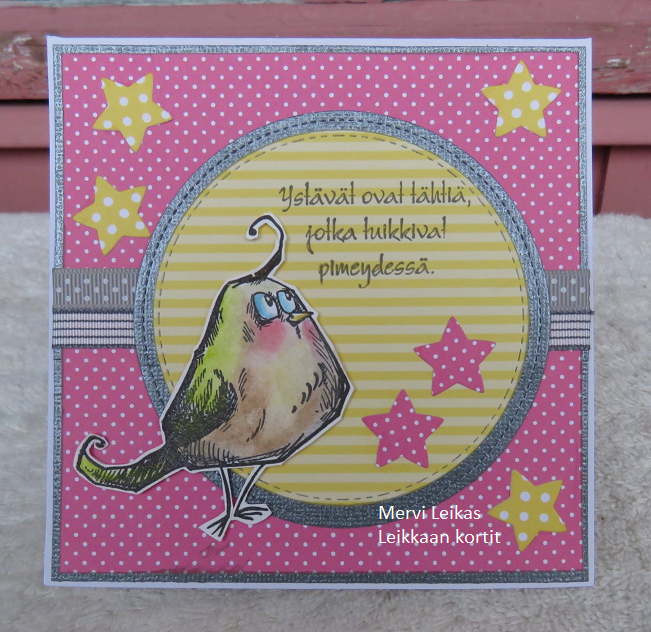 Super cute card Mervi, great image. Cute card. Thank you for entering your wonderful creation at The Crafter's Cafe this fortnight for our "Humorous" challenge.